Today I bring you another Dragonfly Dreams project - but this time with the gorgeous Bumblebee instead of the dragonfly. This project is an adaptation of the one I did earlier on in the month, which you can see here. You can stamp the bee and cut him out using the Detailed Dragonfly Thinlits Dies (and the Big Shot), or you can simply cut him out in Basic Black Cardstock. 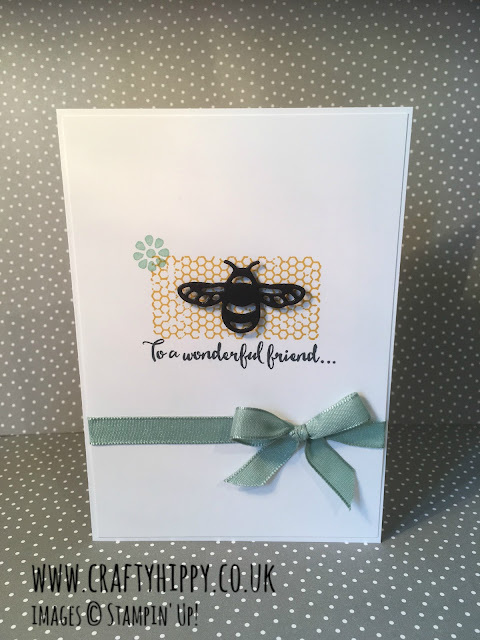 I stamped the flower and the honeycomb using the Butterfly Basics Stamp Set which is also available in Clear Mount and Photopolymer. I used Mint Macaron and Crushed Curry, these unlikely bedfellows look great together. I finished the project off with some Mint Macaron 3/8" Sheer Linen Ribbon. Sale-a-bration is nearly over - hurry! Don't forget to take advantage of Sale-a-bration - it ends in a couple of days. You get a FREE gift for every £45 spent on Stampin' Up! products until the 31st March (while stocks last). Take a look at the Sale-a-bration Brochure.